On Saturday, I went to the Festival of Trees, a fundraiser for Hope House that is being held at the Fredericksburg Expo Center. There are over 100 trees on display, each with a different theme, decorated by individuals or organizations. If you see a tree you particularly like, you can bid on it, silent-auction style, and the highest bidder when the festival ends on Dec. 6 gets to take the tree home. 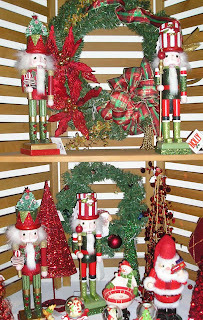 There are also booths selling all kinds of holiday decor, as well as a few vendors selling gift items. This past weekend at the festival, the Rappahannock Model Railroad Club had a large layout with a couple of trains running. 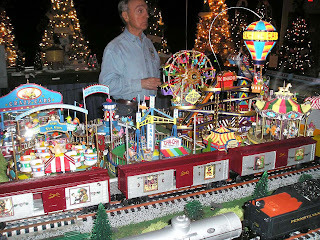 My favorite part of the display was a brightly lit amusement park with vintage rides that reminded me of Coney Island. 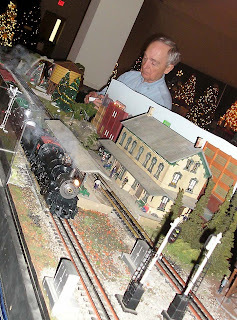 The club packed up the trains on Sunday, but you can catch this setup and more at the Annual Model Train Display on Dec. 13-14 at the National Guard Armory on Rt. 3. We’ve been to see the model trains a few times when the kids were little, and it’s definitely worth the $5.00 admission (only $1 for kids 12 and under). And I have to give a little shout-out to The Accidentals, the a capella quartet that performed two hours worth of Christmas carols on Saturday. Okay, that’s the real reason I went to the event, to hear my friends sing at their first public gig. Great job! 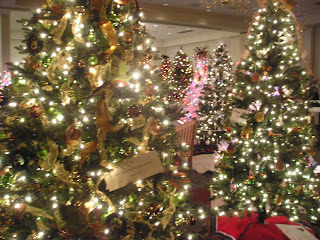 The Festival of Trees runs daily through Dec. 6. Click here for times and more info.